Ethan Arbelo, 11, runs along the beach an hour after leaving the hospital following an emergency related to his cancer on June 26, 2013, in Carlsbad, Calif. Diagnosed in March 2012 with anaplastic astrocytoma grade III, a terminal brain cancer, Ethan was prescribed with merely life-extending, not curative treatment. With the help of his mom, Maria Maldonado, he set out on a cross-country road trip to tackle a list of things he wanted to do. California was the halfway mark. Maria Maldonado comforts her son Ethan Arbelo, 11, after ordering him to rest in the shade during a fundraiser hosted by the Latin American Motorcycle Association of Fort Myers. The fundraiser was held for Ethan’s health related expenses at Harley-Davidson on March 23, 2013 in Fort Myers, Fla. Maria, a single mom, often turned to her community for help because she struggled to maintain employment while attending to Ethan’s constant medical needs. Ethan Arbelo, 11, plays with a radiotherapy mask given to him after completing the last of 28 sessions of radiation at Florida Hospital on May 2, 2013 in Tampa, Fla. Doctors believe that he could expect to live another nine months. 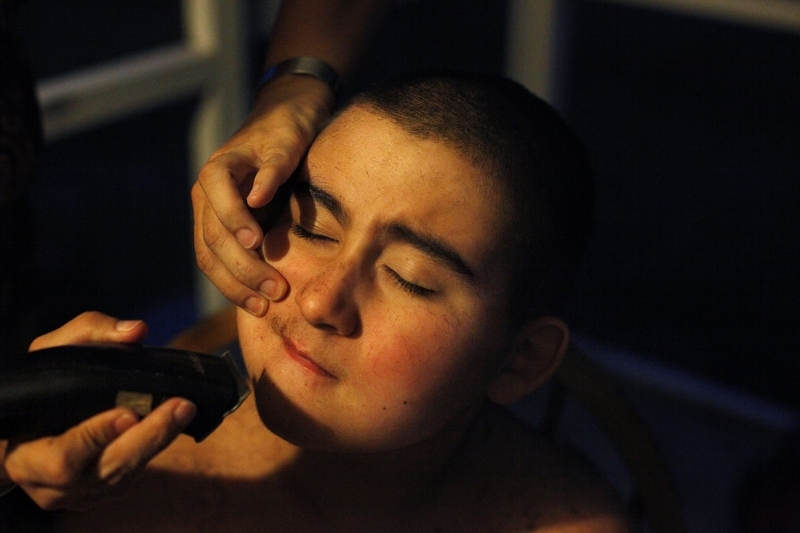 Maria Maldonado shaves 11-year-old Ethan Arbelo’s mustache for the first time on July 31, 2013, in Lehigh Acres, Fla. Ethan was proud of the visible sign that he was becoming a man. “It’s my respect,” he would say about the hair. Ethan Arbelo, 11, kisses 26-year-old Ashley Schroeder at a mud park named The Redneck Yacht Club on May 25, 2013 in Punta Gorda, Fla. Ethan's mom took him to the mud park as a compromise after Ethan asked for a stripper for his 12th birthday. It was the first time Ethan had kissed a girl. “It felt like ice cream melting on my tongue,” he said. Ethan Arbelo, 11, plays in the backyard of a friend’s home who also has terminal cancer on April 10, 2013 in St. Petersburg, Fla. Ethan often found himself imagining superhero scenarios. “I like them so much because, just as someone is about to die, they swoop in and save them,” he said. While playing video games, Maria Maldonado yells at Ethan Arbelo, 12, for not putting more effort into using his left arm, which had begun to paralyze from swelling in his brain on December 2, 2013, in Lehigh Acres, Fla. As Ethan’s sole caregiver, Maria struggled at times with managing her stress and finding a balance of tough love with Ethan as his condition worsened. "This is his battle and he needs to fight with everything in his power, no matter how hard it gets," Maria said. 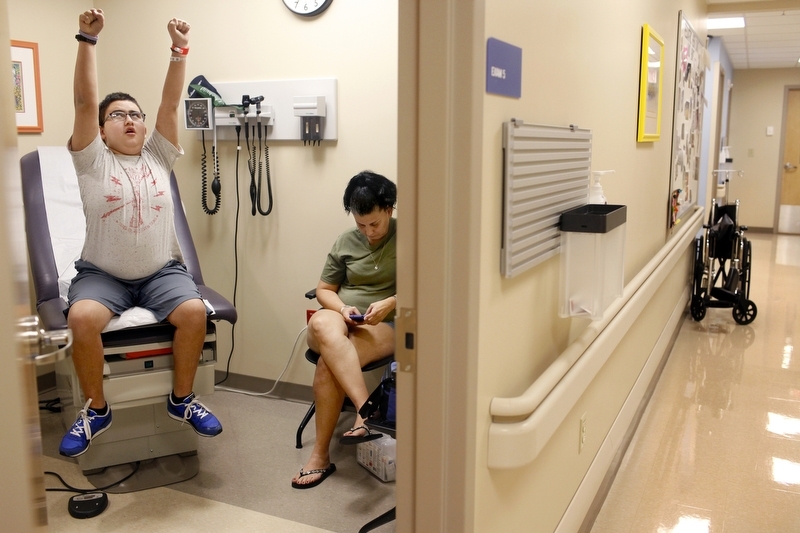 Maria Maldonado gives Ethan Arbelo, 12, one last hug before he heads for an MRI on November, 20, 2013 at All Children’s Hospital in St. Petersburg, Fla. The MRI will show that a tumor has taken over Ethan’s brain and cancer has spread into his spine. Doctors will inform them that there is not much more they can do. Reggie Iacono, right, helps Ethan Arbelo, 12, choose a poster for his bedroom while out for a boys’ day on February 21, 2014 in Fort Myers, Fla. Reggie, the son of one of Maria’s friends, moved in with Maria and Ethan in January to act as Ethan’s caregiver for a few months while Maria was back at work. 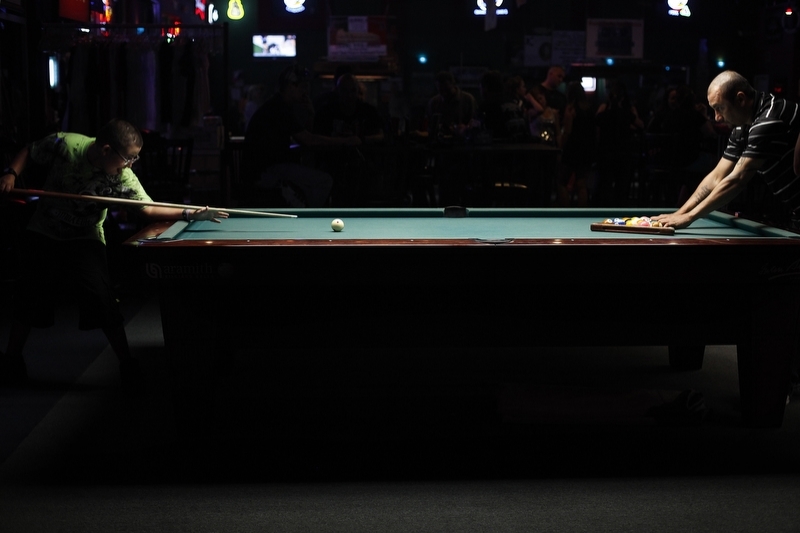 Jose “Tito” Arbelo decompresses in Lehigh Acres, Fla., on January 17, 2014 after an argument with his ex-wife Maria Maldonado about his absence in the life of their son, Ethan Arbelo, after he was diagnosed with cancer. Tito surrendered full custody of Ethan to Maria shortly after his diagnosis. A third-grade school portrait of Ethan from two years before his diagnosis hangs on the wall beside him. Too weak to walk on January 17, 2014, Ethan Arbelo, 12, plays with Superman action figures in a reclining chair where he spends most of his days in Lehigh Acres, Fla. “It’s heartbreaking watching your child revert,” Maria said. Maria Maldonado sits in the Gulf of Mexico with her 12-year-old son, Ethan Arbelo, after he requested to take a dip on April 16, 2014, on Fort Myers Beach, Fla. Two friends helped Maria carry Ethan to the ocean, one of his favorite places. It was the last time he visited the beach. Maria Maldonado and Ethan Arbelo, 12, watch as violinist Nanette Grant plays a private concert on June 12, 2014 in Lehigh Acres, Fla. “I’ll do anything to get his spirits up,” Maria said. 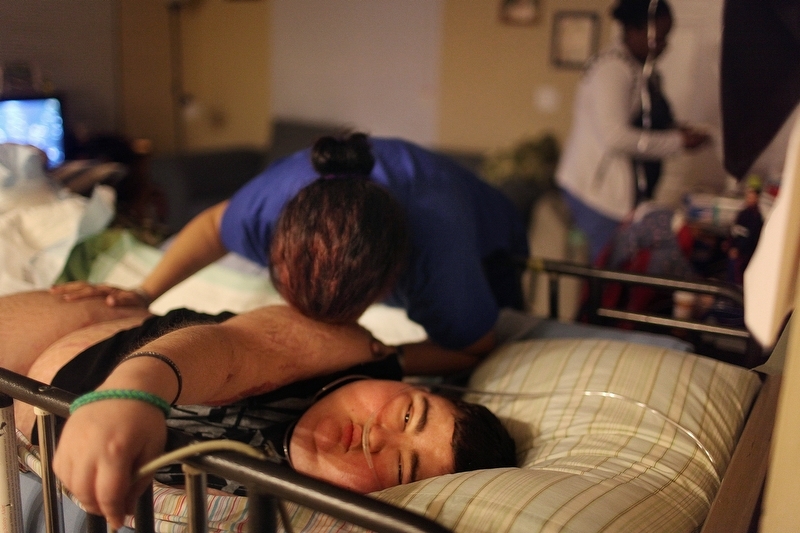 Maria Maldonado prepares Ethan Arbelo, 12, for sleep on May 21, 2014, in Lehigh Acres, Fla. Ethan was losing his eyesight due to the buildup of fluid inside his brain. “It feels like I’m losing my best friend,” Maria said. 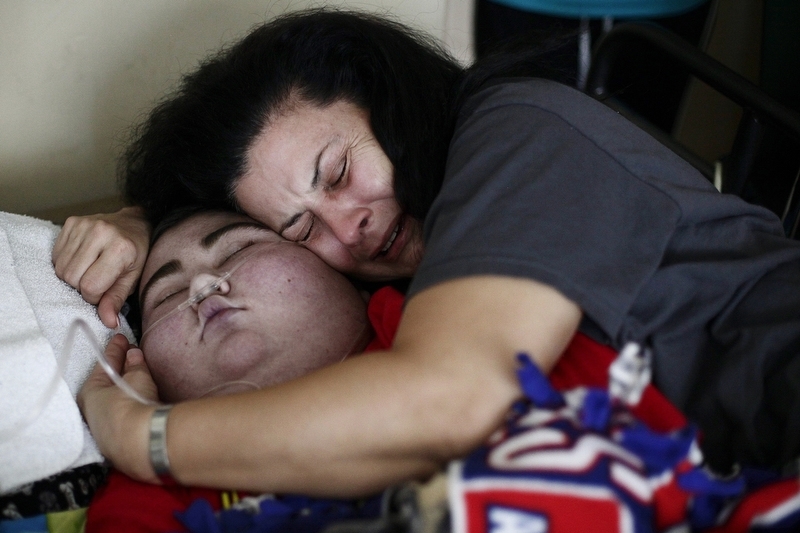 Maria Maldonado cries hugging Ethan Arbelo, 12, as he transitions into death on July, 3, 2014, in Lehigh Acres, Fla. “In those last minutes when you know your son is taking those last breaths, all you’re doing is praying for death for you too because you can’t imagine life without your baby,” Maria said. 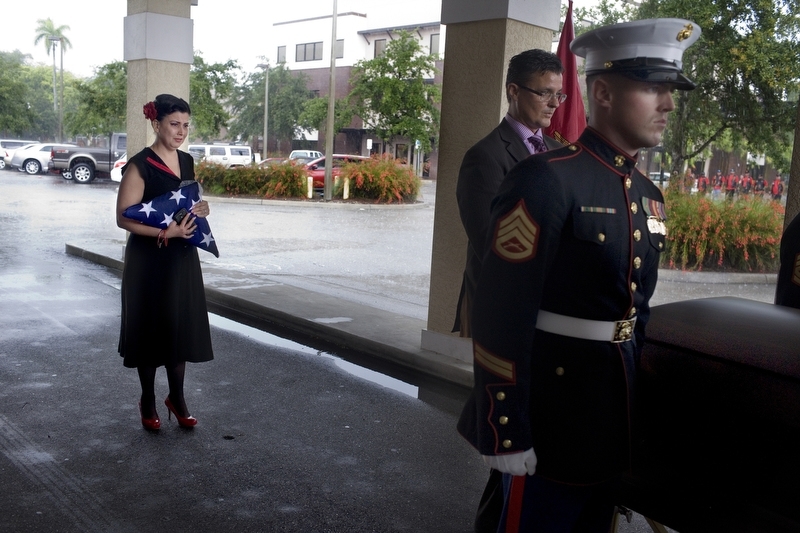 Maria Maldonado watches on as Marine pallbearers carry the casket containing her son, Ethan Arbelo. In October, Ethan was named an honorary Marine. He died with the rank of sergeant. 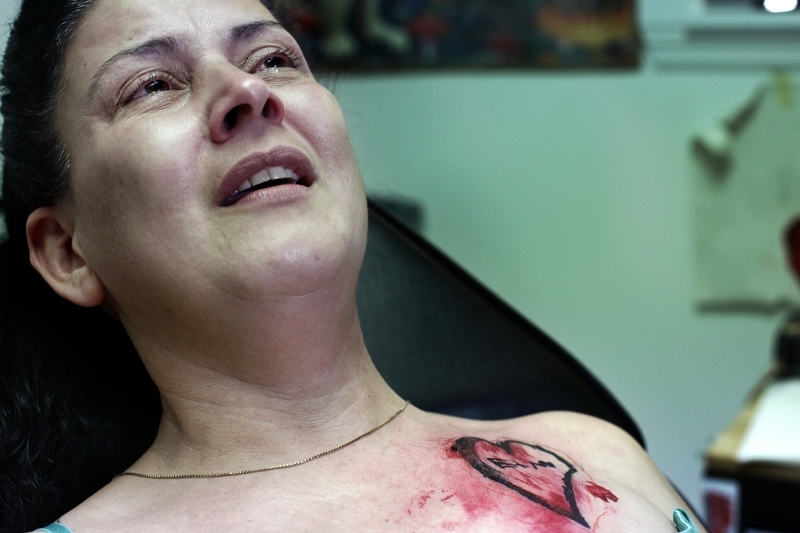 “Thank you all for loving my little man,” Maria said during the funeral at First Christian Church on July 12, 2014 in Fort Myers, Fla.
On July 5, 2014, two days after Ethan Arbelo died, Maria Maldonado receives a tattoo at Ink Cafe in Cape Coral, Fla, of a drawing Ethan made with their initials just before losing movement in his hands. “This way he is always with me,” Maria said.